Malakwal, Pakistan—For Riaz Bibi, giving birth was an arduous, painful experience that led to severe bleeding and weakness, which compromised her overall health. Her first three children were born at home with the help of a traditional but untrained birth attendant. She recovered from each of the births. The birth of her fourth child was so much more difficult that the 33-year-old religious school teacher had to be taken to the hospital, a 25-minute walk. When she arrived at the hospital, her baby was dead. “That was a great loss for me, which left me unstable, both physically and emotionally, for quite some time,” the young mother recalled. As Riaz Bibi struggled to regain her health, a community health worker from her village who had been trained by Jhpiego in postpartum care (PPC) would periodically visit and check on her. Mussarat Parveen, the “Lady Health Worker,” as these frontline community health care providers are known in Pakistan, talked with the young mother about the benefits of giving birth at a health facility. There, Riaz Bibi could be assisted by a provider who was trained to assess and respond if birth complications arose and who would ensure that she received three wellness check-ups in the first six months after delivery, as the World Health Organization recommends. Riaz Bibi recognized the benefits of such care, and when she was pregnant again, she and her husband decided to attend the government-run health facility in Malakwal. From antenatal care to postpartum family planning counseling and post-birth care for her new baby, Riaz Bibi received a full range of services from the Lady Health Visitors, who are full-time government health workers. Riaz Bibi was so pleased with the services that she traveled to Islamabad to attend a special event and offered noteworthy praise for the Improving Postpartum Care for Mothers & Newborns in Pakistan program, which was supported by Research & Advocacy Funds (RAF) and implemented by Jhpiego. She commended the work being carried out in partnership with the government of Pakistan to reduce maternal and newborn deaths. 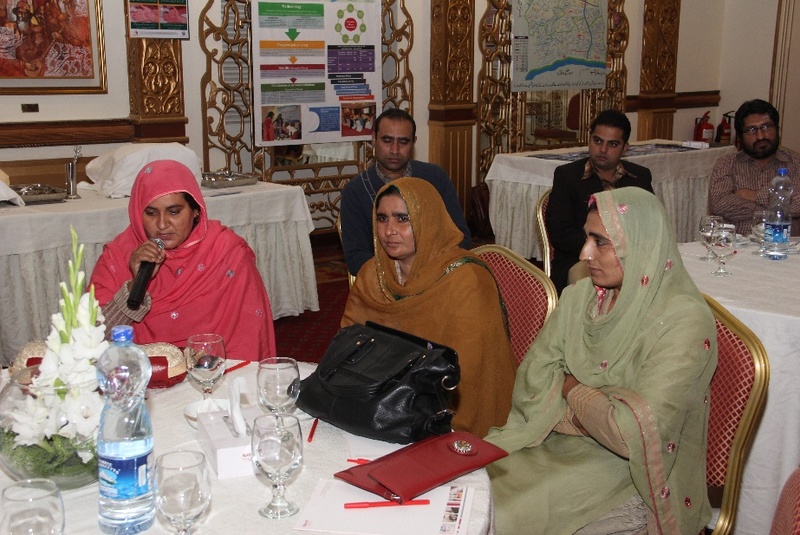 Riaz Bibi is one of the 2,335 women who participated in the five-year PPC program. Comprehensive, high-quality PPC delivered at the right time has the potential to save the lives of mothers and newborns, prevent unwanted pregnancies, and start mothers and babies on a healthy journey together. “My baby delivered within 15 minutes of my arrival at the facility, and I was better able to manage pain during the birth,” Riaz Bibi told attendees at the event in December 2014. Following the birth, she said, she received a postpartum intrauterine contraceptive device (IUCD), a long-acting but reversible family planning method that she and her husband chose after receiving information and counseling on healthy birth spacing from Lady Health Visitors at the Malakwal facility. Riaz Bibi (left) is appreciative of the care she received. As part of the PPC program, the Malakwal facility and two other rural health centers received support for systems strengthening, including staff training, provision of essential equipment and supplies, and supportive supervision. The support led to improved health care delivery and services by health care providers whose skills had been upgraded. Since the start of the program, Lady Health Visitors in Malakwal have seen an increase in the number of new mothers participating in postnatal care, with 52 percent of the mothers who had two postpartum visits also having attended a third visit. Riaz Bibi told the participants at the meeting in Islamabad that the attitudes and skills of service providers can really influence a woman’s decision to attend postnatal care as routinely as she attends antenatal care. A study of the PPC program in the Mandi Bahauddin district reported increased use of PPC and acceptance of a family planning method. According to the study’s findings, 30 percent of the 1,200 women in the intervention group reported receiving the targeted three PPC visits, while only 19 percent of the 1,200-member control group received three visits. That’s noteworthy considering the struggle health care providers in many developing countries face in ensuring that women receive care following birth. Family planning uptake was also much higher than expected in both groups, and significantly higher in the intervention group; 70 percent of the women in the intervention group and 66 percent of the women in the control group reported using a family planning method at six months. The study concluded that a PPC program “implemented appropriately and at scale … will reach the most underserved women and families in a manner that overcomes barriers to service access, allowing poorer and less-educated women the same benefit of services as those women with greater means and opportunities.